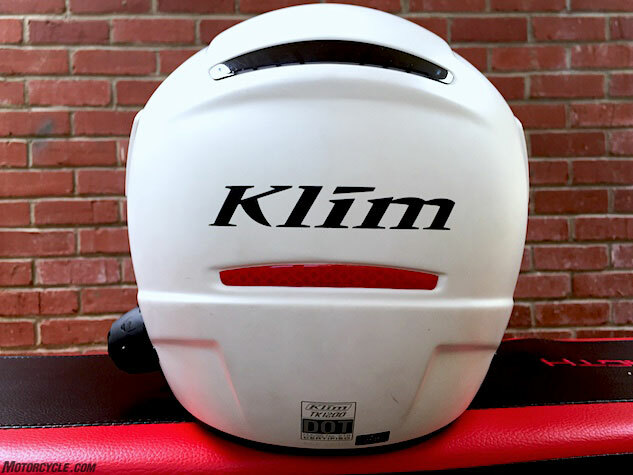 Klim’s a new player in the modular streetbike motorcycle helmet game. With a reputation of constructing technical apparel – oftentimes of the high-end, expensive variety – it should come as no surprise the company managed to create a quality modular lid for a price commensurate with competitors Schuberth and Shoei. The TK1200 retails for $599 compared to Schuberth’s C3 Pro ($629) and Shoei’s Neotec ($649.95). Unlike those two models, the Klim helmet’s shell is constructed of carbon fiber in a process where pre-impregnated fiber weaves are combined in a polymerisation heat-and-molding process. The result is said to be a higher quality construction and unmatched consistency. While that claim is hard to measure, what is measurable is the helmet’s weight, and to that point the TK1200 is light, weighing in at roughly 3.4 pounds on MO’s scales in the painted white version (the unpainted version is said to be closer to 3.0 pounds). 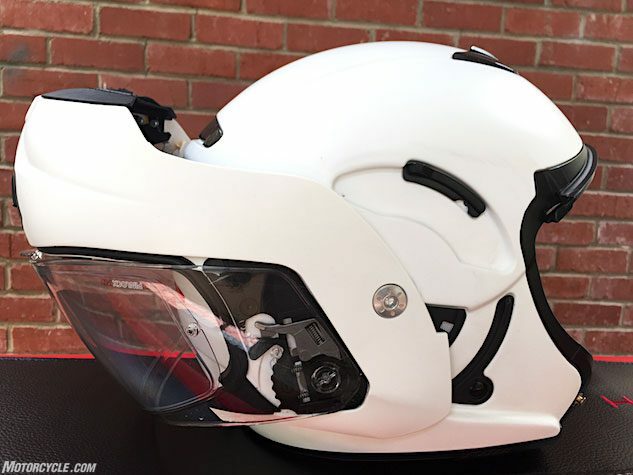 That’s light for a normal full-face helmet let alone a modular one (Schuberth E1 size Large: 4 lbs, 0.1 oz, Shoei Neotec size Large: 4 lbs, 0.5 oz, HJC IS-MAX II size Large: 3 lbs, 15 oz). Even with a Sena SMH10 communicator, boom mic, and speakers mounted the TK1200 came in at 3.8 pounds. Helping minimize weight is the use of a Transitions faceshield in lieu of an internal sun visor, common among many modular helmets. The Transitions shield comes stock on the TK1200, but when replacement time comes, you’re looking at a $150 price tag. Still worth it for the convenience of never being stuck with the wrong faceshield. In the event of a crash where the chinbar is either improperly closed or the latch fails, the chinbar is designed to go past the point of normal operation. In addition to the helmet’s lightweight carbon fiber shell and Transitions faceshield, the TK1200 boasts other niceties such a Pinlock anti-fog insert, removable chin curtain for keeping air from coming up the front of the wearer’s face, speaker pockets for a communication system, and a removable, washable comfort liner. Sizing of the TK1200 is on the small side. The size Medium I was originally given – the size I wear in every helmet I own – was exchanged for a size Large after the Medium proved to be painfully tight. 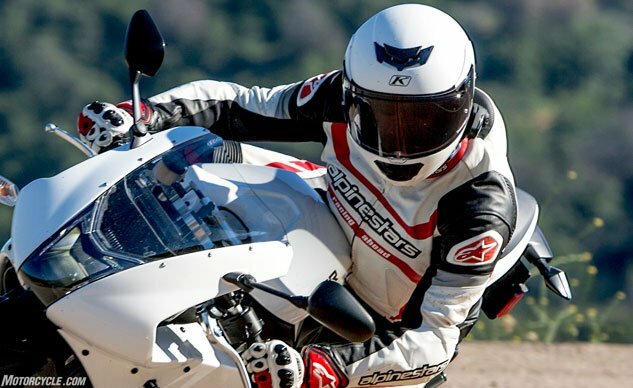 The TK1200 comes in sizes S – 2XL, but considering the helmet’s real-world fitment sizing categories, XS – XL seems more appropriate. The sizing irregularity could stem from there only being only one shell size accommodating the range of fitment sizes. As with any helmet-buying decision, we strongly recommend trying on a helmet before making your final choice. 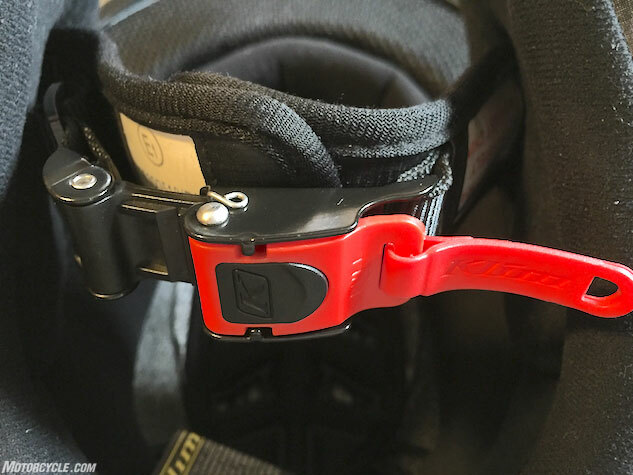 Occasionally more contentious than the current state of U.S. politics is the use of a buckle to secure a motorcycle helmet instead of D-rings. After appropriately adjusting the buckle it’s simple to latch and utilizes a dual-hinge system to unlatch, keeping the buckle secure during a crash, while also making the release function a one-handed affair. The TK1200’s interior headform is intermediate-oval in shape, which I found to be acceptably comfortable for all-day riding. However, the size Large seemed to allow the ceiling of the helmet to rest atop my head, meaning my skull’s crown was supporting a lot of the weight of the helmet. There was also a minor issue with the ear cutout, speaker pockets and comfort liner causing slight discomfort with my ears. Like the TK1200’s weight, quietness is also a hallmark of the helmet. Many times I found myself riding without earplugs because the TK1200 does a great job of minimizing wind noise. Occasionally, depending on what model motorcycle I was riding (naked or with fairing) and the speed I was traveling or if there was a crosswind, etc., I noticed a whistling, but it was rare. The rear of the helmet features a reflective insert, as well as reflective accents in the rear of the neck roll and in the chin curtain. The TK1200 meets both DOT and ECE 22.05 safety certifications but not Snell. The TK1200 performed well at higher street speeds, exhibiting aerodynamic stability with no excessive movement or wobbles. The ventilation system helps flow cooling air to a hot scalp, but we’ve experienced better cooling ventilation in other helmets. The faceshield’s quick-release system is a little quirky, necessitating more effort than should be required. The chinbar opens via a central button beneath the chinbar intake vents. The opening/closing action of the chinbar is smooth and snaps into place without much force. The interior of the chinbar seems somewhat unfinished due to the exposed mechanics of the locking mechanism. The gaps in the seam between the chinbar and helmet aren’t as tight as what you’d expect from a premium helmet. Even with these nitpicks, the TK1200, at $599, is an option to be considered if a person is looking in the $600 range of modular helmets. Its combination of light weight, Transitions shield and Pinlock makes the Klim a formidable bargain against more expensive modular helmets. For more information on the TK1200 Karbon Modular or other helmets in Klim’s lineup go to Klim.com.